What makes a ragdoll so special? The ragdoll was named after the floppy fabric doll that sits quietly wherever you put it. Like the doll, the cats are extremely docile and a little floppy. One of the biggest reasons the Ragdoll has become so well known is for its relaxed and easy going temperament. Ragdolls are a trusting and loving cat. They are highly domesticated and many do not posses the “fight” instinct nor do they use their claws for self defense.Ffor these reasons the Ragdoll must be a strictly indoor cat! The relaxed, trusting nature of the cat is also why a lot of Ragdolls posses the ability to go limp or floppy when picked up. Ragdolls can also be very dog like giving them the nickname of Puppy-Cats. Their loyalty to you will find them waiting at the door for you to return home. They will follow you from room to room and insist on “helping” you with all of your tasks. They are smart cats and many easily learn your favorite dog tricks such as “sit pretty” and “fetch” with a favorite toy. Most highly enjoy a good belly rub. Ragdolls tend to not be big jumpers and are easily trained to stay away from off limit areas such as tables and counters. They seem to prefer to stay close to the ground although the do treasure thosehigh place just for them such as a cat tree or the back of the couch. They are a quieter breed of cat which prefers using purrs, birdcalls, and soft mews as opposed to loud meows. The Ragdoll is an ideal family pet making special bonds with each member of the family. They adapt easily to just about any type of household whether it be a quiet home with only one or two members of the family or a loud, busy home with children and /or other pets and anything in between. Ragdolls can also be very curious at times. They LOVE playing in bags and boxes. If you open a closet door or cabinet they are usually right inside checking out this new adventure. They like to watch birds, fish and T.V., and love to get new toys, so it is good to provide them with something to keep their minds busy. They are also very smart and can learn to open cabinets and doors. But you know what they say about curiosity and the cat, so if you have a Ragdoll please "child-proof" your home for his/her safety. the face, legs and ears are a darker colour than the rest of the body. The Ragdoll is a slow maturing breed. 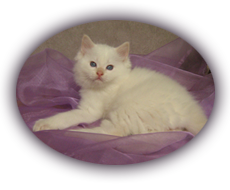 Ragdoll kittens are born pure white and can take up to two weeks before accurate color and pattern can be determined. and weight ( males 7-10kg or 14-18 pounds and females 4-6kg or 9-13 pounds) maturity.